I’d quite like a bathroom now please…. The house that belongs to the ‘King of the Village’ but what would my mother think? It is one thing entirely to fall in love with house with holes in the roof and a snake living in the utility room. To see beyond the rats nests and broken toilets yourself. And to then exist in a little bubble of contentment, reassuring yourself that ‘one day’ it will be a palace. It’s rather like falling in love with a boy – you love him despite his habitual refusal to close a drawer after taking something out of it, his manky Ramones t-shirt and his love of You’ve Been Framed. And so it is with a home. You see BEYOND! Mice scurrying away in the room next to your bedroom? Ah, yes that would be the ‘at one with nature’ feature! The inability to have both cooker hob AND the kitchen lights on at the same time? Cooking by candlelight – how romantic! 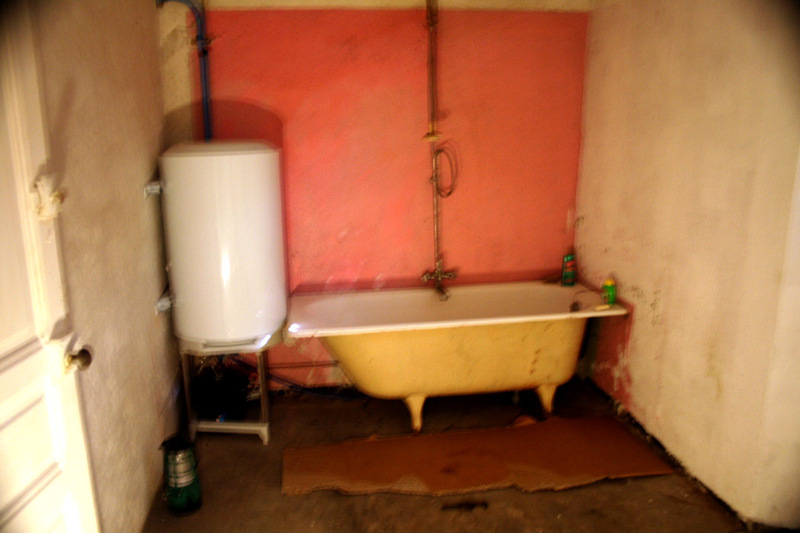 An old tin bath and no shower. POTENTIAL! But when others enter your heavily blinkered world – you begin to see it via their eyes and suddenly you have a broken old house and a holiday that only weird intellectuals wanting to ‘test’ themselves would go on. Club Med it was not. And so it was with my parents impending visit – would they love it? Would they see it’s charm? Thank god parents don’t judge – right? We needed a bathroom. And we needed one fast. One that not only had a bath, a loo and a hot water tank but maybe a floor. Some tiles perhaps. I’d already optimistically purchased some Missoni towels and a bathmat – oh and a lovely Cowshed soap and handcream dispenser – optimism you see – it even says on the Cowshed website that this set is a MUST for any kitchen or bathroom! The rotting wooden ceiling in our bathroom needed all the gaps filled and each bit painted at least three times with eggshell. Our arms grew tired from reaching up to paint and our hair, faces and clothes were permanently splattered with tell tale droplets of white paint. Our friendly local pizzeria patron (also called Serge – confusing!) grew used to us turning up in search of les pizza royale (ham and mushroom) exhausted and looking as if we were an installation in Tate Modern so indelibly splattered were we. Got to be time for a tea break lads? 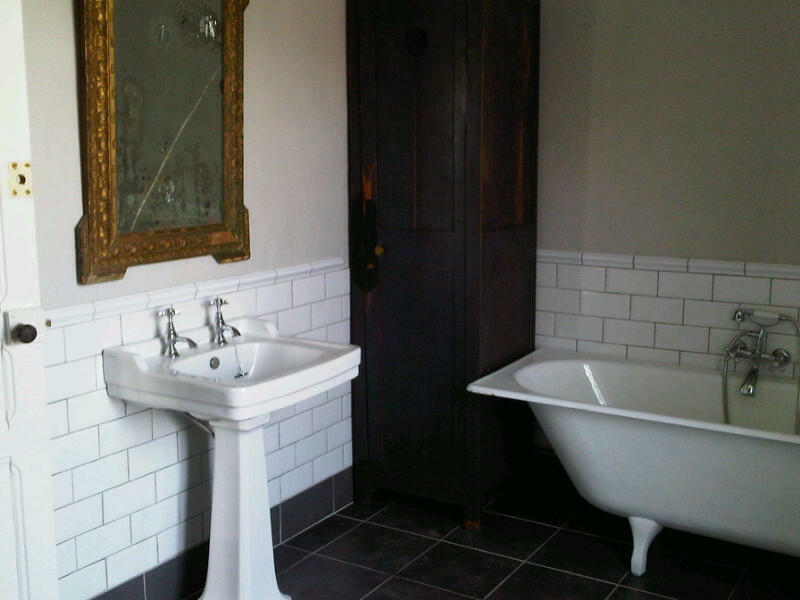 I think from memory – Peter must have gone again by himself and driven the actual bathroom over to France because although we salvaged the original cast iron bath, the loo and sink were bought at a discount bathroom specialist near where we live in Greenwich. 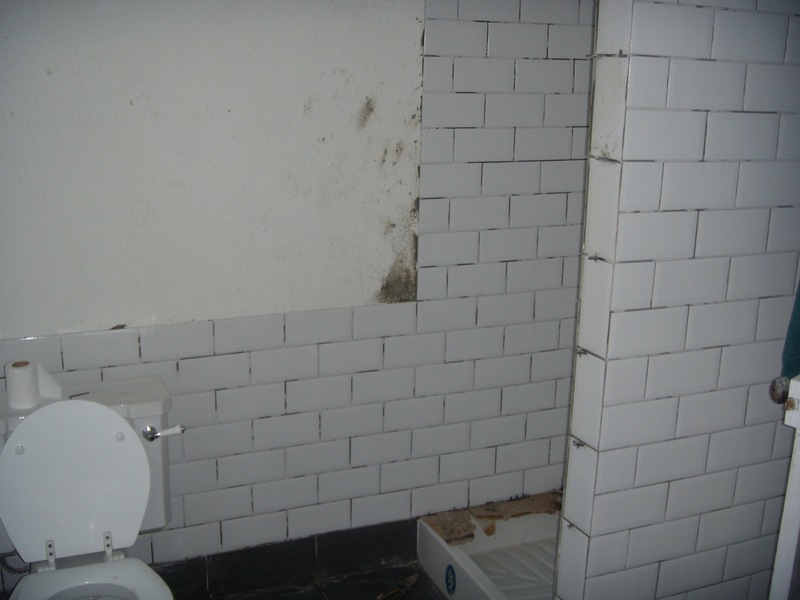 Luckily for me – most people don’t want traditional looking bathroom suites any more – they want Stark toilets that hurt your bum when you sit on them because they are square and your bum is not. They want fancy open spout waterfall taps and don’t get me wrong, I love that stuff too in my London home. In fact, watch out for my spin off blog ‘we bought a wreck in south east london’. But for rural France, I needed rustique, homely and ecclectic. One of the major allures of this renovation project was that I could decorate and furnish this home with lots of things I wouldn’t have in London. I wanted it to feel a little bit countrified and traditional. I wanted wallpapers, pretty light fittings and faded antiques. 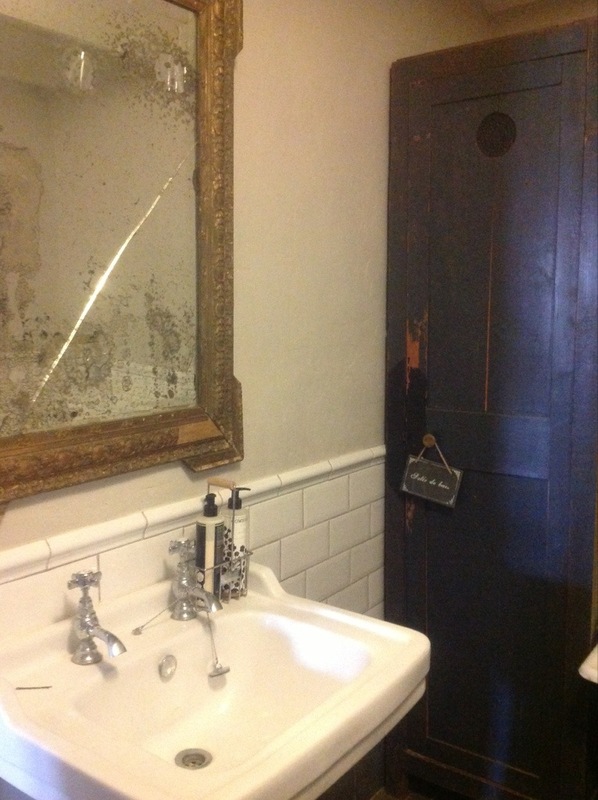 So, I got myself a Victoriana bathroom suite – unwanted by London urban sophisticates – snapped up by me for a couple of hundred pounds including taps. And the tiles – well B&Q’s finest (cheapest) slate floor tiles and good old white metro tiles with dark grey grout completed my modern country theme. When we first went to look at our house – the bathroom was DISGUSTING – like the onewhere Ewan McGregor falls down the loo in Trainspotting – only with Ivy growing on the inside. It was dark, gloomy and almost impossible to enter. But I could always imagine how it would look. And now it does. 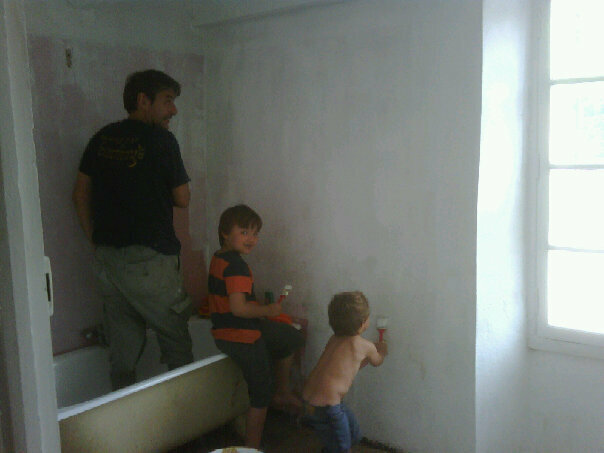 The walls we painted Cornforth White by Farrow and Ball and then we had just a few finishing touches to add. A cracked mirror and old painting were found at local Vide Grenier’s – I’m going to do a post dedicated to all the tat (interesting local artifacts!) 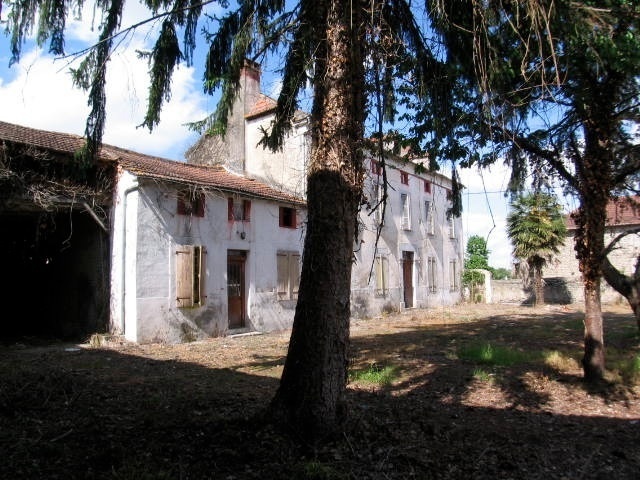 we have bought over the years at Vide Greniers – I just need to photograph it all! Held on a Sunday they are like car boot sales but much much better – and they usually have wine at them even at 10am in the morning! And a cupboard was found in a local Brocante shop and tied to the top of our car and driven back slowly. So, our bathroom was finished. We were finally able to retire that bucket! Although by the time we actually had a working toilet, the boys had got so used to peeing in the garden they were a bit loathed to go back to using sanitaryware. And you know what – I was kind of fine with that. Just not while Gran and Grandad were around!!!! 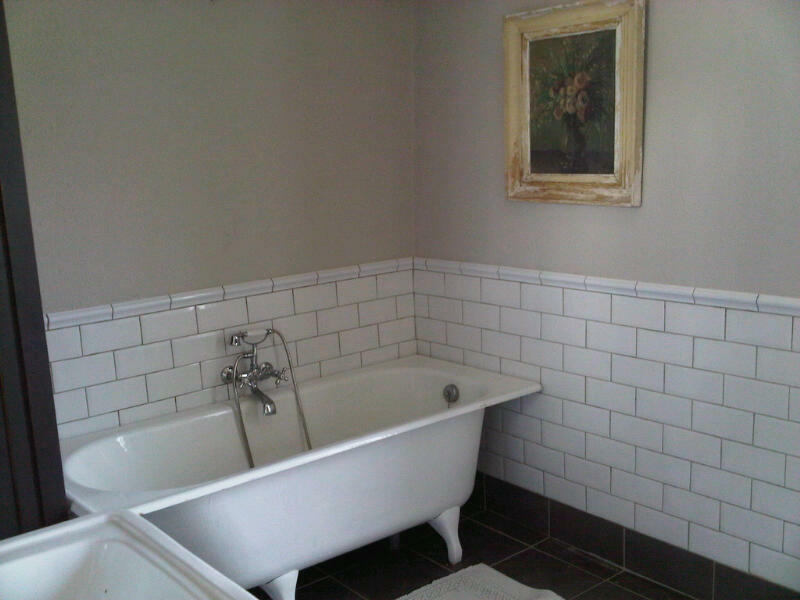 This entry was posted in bathrooms and tagged cornforth white, diy, farrow and ball, home, metro tiles by vicawhite. Bookmark the permalink. Wow, you have done a brilliant job. Looks very chic.